The Omron® 5 Series Upper Arm Blood Pressure Monitor (BP742) features a two user mode which allows two users to measure and track their readings separately in memory to better understand their changing blood pressure over time. rregular Heartbeat Detection – This monitor can detect irregular heartbeats while your blood pressure is being measured. If an irregular heartbeat is detected, an indicator icon will appear alerting you so you can consult with your medical professional. Includes Standard Adult Cuff 9in to 13in. 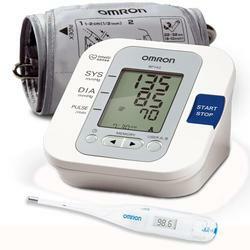 Includes Omron MC-249 Thermometer. 2 Year limited warranty. Two User Mode – Allows two users to monitor and track their readings separately in the stored memory. Advanced Averaging – Exclusive technology automatically displays the average of up to the last 3 readings taken within the last 10 minutes. Irregular Heartbeat Detection – This monitor can detect irregular heartbeats while your blood pressure is being measured. If an irregular heartbeat is detected, an indicator icon will appear alerting you so you can consult with your medical professional. 60 Memory Storage – 30 memory storage for each person (60 total) with date and time stamp that allows you to review the last 30 readings with a touch of a button. D-Ring CuffArm 9"-13" D-Ring CuffArm 9"-13" ComFit™ CuffArm 9"-17" ComFit™ CuffArm 9"-17" ComFit™ CuffArm 9"-17"
Large adult cuff for all Omron digital blood pressure monitors except HEM-711AC, HEM-747 and HEM-739AC. Fits arms 13 to 17 in circumference. Small cuff for Omron HEM-711AC, HEM-747, HEM-705 and HEM-739AC blood pressure monitors. Fits arms 7 to 9 in circumference.